Week Two of the Binder Challenge and we are still going strong. So strong, actually, that I am hoping we find some so-so recipes soon, or else this "binder cleanup" will only lead into buying a bigger binder, since we won't have discarded enough pages from this one! This week, we tried out two main course dishes of differing ethnicity and difficulty. Let's start with the easier, but no less flavorful, of the two. 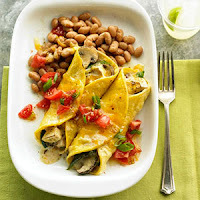 Mushroom and Poblano Enchiladas, featured in the September BH&G issue, were an easy, healthy and flavorful way to start off our week. For those of you unfamiliar with them, a poblano pepper is a spicy green pepper that is the star in Mexican dishes like Chiles Rellenos. They have the ability to kick your socks off with their heat, but they can also be surprisingly mild. It makes mealtime fun, not knowing which version your selection might be! While the basic enchiladas in the recipe are probably great, I thought they needed something on top to complete the meal. So we added a can of warmed enchilada sauce all over the top, and left them under the broiler a bit longer to heat all of that through. The result was an easy go-to recipe that took all of 30 minutes start to finish. The second meal we made this week is one I might usually term a "Sunday Dinner" due to the sheer length of prep time. You have to peel and dice and roast and bake and simmer. But at its core, Risotto with Butternut Squash, Pancetta and Jack Cheese from Cooking Light is a comfort meal worthy of serving to your haughtiest of dinner guests. Oh my goodness, it was SO GOOD. 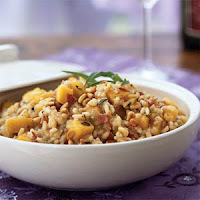 This squash version quickly dethroned the Parmesan Risotto with Spinach and Scallops that has been our go-to favorite risotto. Stay tuned next week for our next recipe attempts! Jewel - try them out, they are so easy! !